Sweet Dreams $13.99 (Californian Muscat) This fresh and vibrant white wine is a true crowd pleaser. Light-bodied with aromas of passion fruit, pineapple, elderflowers, and lychee, a sip of this wine will treat your palate to an impressive lineup of tropical and stone fruit. Morning Dew $12.99 (German Gewurztraminer) Off dry with tropical fruits on the palate. This is a soft structured, floral wine with balanced crisp acidity. Sun Kissed $12.99 (Raspberry White Zinfandel) Mouth watering flavors of sweet ripe raspberries blended gracefully with the delectable refreshing character of a white zinfandel. Rockabye White $13.99 (Italian Pinot Grigo) The bouquet reveals bright citrus and green apple aromas with honeydew tones. Evening Rain $12.99 This deep red Elderberry wine is lightly oaked. Starting off sweet and ending slightly tart has made this an extremely popular wine. Starry Night $13.99 (Austrailian Cabernet Sauvignon)The warm southern sun produces a bold Cabernet Sauvignon with the varietal’s signature nose: blackcurrants, dark chocolate and subtle toasty notes. Fermentation on GenuWine Winery Dried Grape Skins and toasted American oak produces a full-bodied wine with hints of coffee and vanilla notes. Red Passion $17.99 (Blend of Merlot, Cabernet, & Syrah) Fruity and flavorful--Our first blend provides you a full bodied and velvety wine with flavors of blackberry, raspberry, dark chocolate, and soft oak. 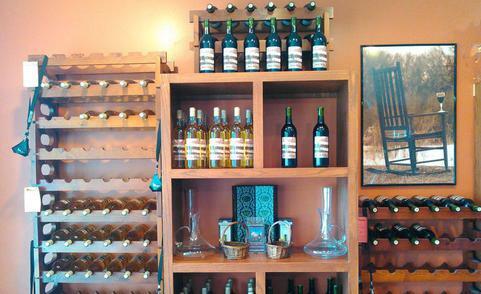 These wines are a specialty wine and are not always available. Please call in advance to see what we have in stock. Sunset Meltaway $14.99 (Coffee Port style) Dessert in a glass! Full bodied and a finely balanced hints of coffee and a medium sweet vanilla finish. These wines are easy to drink and provide a perfect balance of fruity flavors--not too sweet and not too dry. They can be enjoyed on their own, over ice, or mixed into your favorite cocktail. Enjoy on the patio, poolside or around a campfire in the company of good friends! Summer Harvest $12.99 (Tropical Lime) Fresh and zesty lime notes are perfectly balanced with the subtle flavor of coconut & citrus. A sure warm weather crowd pleaser. Enjoy with a salt or sugar rimmed glass! Autumn Breeze $12.99 (Green Apple Gewurztraminer) This popular straw colored wine is intensely flavorful, reminiscent of a freshly cut green apple. The pleasant soft acidity and luscious, fruity aroma of this crisp wine make it a great refresher for a hot summer day. Winter Breeze $12.99 (Blueberry Shiraz) Experience the exciting combination of freshly picked blueberries with a delicate touch of tannins and structure. This semi sweet wine is best enjoyed slightly chilled. Winter Harvest $12.99 (Blackberry Merlot) Colorful tastes of juicy blackberries and ripe currants round out a truly flavorful experience to share with friends.